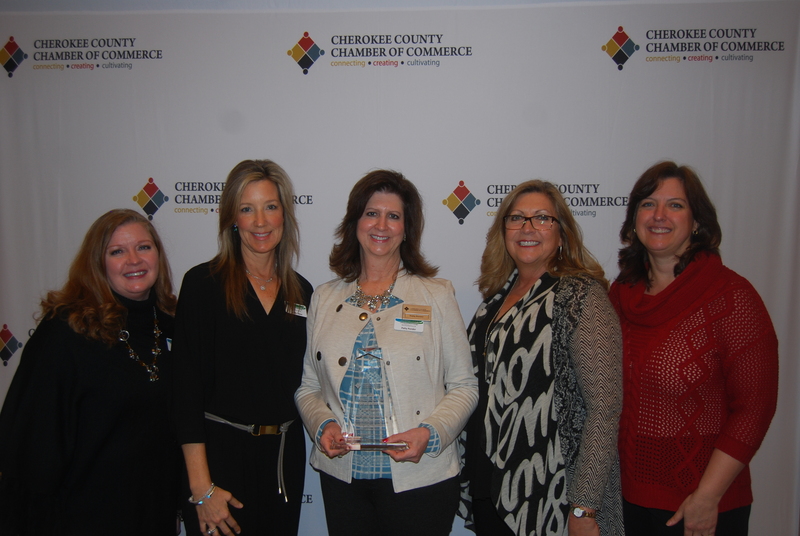 We were named Cherokee Country Chamber of Commerce’s Small Business of the Year! We are extremely grateful, humbled and honored to have been the recipient of this year’s Cherokee County Chamber of Commerce Small Business of the Year Award. What began as an effort to bring a true sense of community by providing hyper-local information through the TowneLaker, flourished into AroundAbout Local Media, consisting of the TowneLaker, Around Woodstock and Sixes Living magazines. The foundation of our publications has always been to build stronger communities. We achieve this goal by sharing positive and relevant information about the neighborhoods that our readers are proud to call home. Since we are community based, we feel it is our mission to help local small businesses around us by offering affordable and effective advertising in a publication that our readers read and retain throughout the month. This award, in combination with our wonderfully engaging customers, has been an affirmation that we are succeeding in our goal of providing a sense of community. We also enjoy being a resource for our community; a job we are honored to have earned. With this award, we are humbled that our mission and efforts have been recognized. We must say THANK YOU to each and every reader. You have fueled our ambition to highlight the amazing people that enrich our community. And to those who choose to support us via their advertisements, THANK YOU. You have helped us enrich our local neighborhoods by encouraging our readers to shop local. Cherokee County has so much to offer and we are honored that you have chosen our publications as a community resource of value. We will continue to build our community through our publications. We hope you will continue this journey with us.